This modern coffee table forms part of the Hudson Living collection, by Frank Hudson. Featuring a simplistic design, this oval designer coffee table is the perfect addition to any living space. 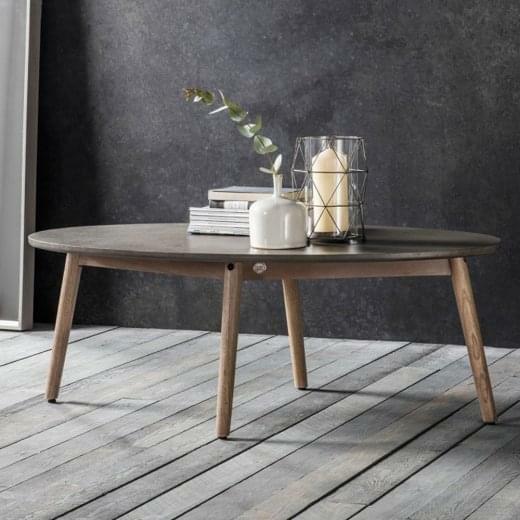 The Frank Hudson Bergen coffee table offers a scandinavian meets industrial vibe, especially with its faux concrete top surface. 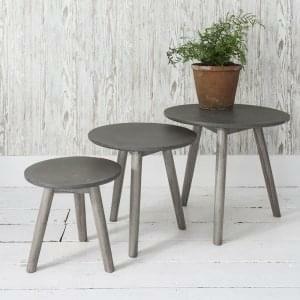 Other features include scandi weathered legs. FurnitureSOS offer free delivery on this desirable coffee table, which is sure to transform your home into a home which is bang on trend. Hudson Living offers a wide range of high quality furniture. Throughout the range, the Frank Hudson heritage is at the core of each and every design within the Hudson Living brand. The collection consists of a variety of modern pieces which combine traditional craftsmanship with new technology; creating an on-trend range of furniture which will complement and designer living space. Such furniture includes modern coffee tables, dining tables, chairs and more. If you're looking to make a statement in your home, look no further than the Hudson Living range.